Our first feeling was that there were too many people attending the 21st Spezi Special Bikes Show in Germersheim this year. It was very difficult to take photographs in the halls. It could have had something to do with the weather. It was brass monkey weather and wet with it, at least on Saturday, so the outdoor exhibitors definitely had to stamp their feet to keep them warm. We spent some time wandering around the three halls but I have never run round the outdoor stands as quickly. My second feeling was why the Germersheim Stadthalle administration cannot organise fitting fresh roller towels in the male WCs. There are four machines but in my experience over the years only one will have a wet wrinkled tail of towel hanging from it. SPEZI is the world's largest show for recumbents, recumbent tricycles, quadracycles, folding cycles, tandems, family cycles, velomobiles, transporters, electrical bikes, special needs bikes, adult kick scooters, child and load trailers, customised designs and accessories. 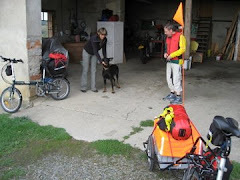 Our feeling was that it is still a show for the type of bike or trike that causes onlookers to ask questions. The show has got a bit slicker over the years, but it is still down to earth and you can easily spend half an hour or so chatting to chief engineer of a bike or trike company. There aren't many salesmen or -women in suits knowing little about the products only how to sell on the stands. My feeling is that we visitors are all trike/folder/cargo bike fans/freaks/nerds together with family and friends looking at vehicles for disabled or vertically challenged members or mates. The market for disabled folk plays a major role. I was surprised but I read today that Transport for London has found that around 15% of disabled people in London actively cycled for transport in 2014, compared to 18% of non-disabled people.The other trend I felt was important was city centre logistics and transport for craftsmen using cargo bikes and e-bikes. There were even four British bike or trike manufacturers represented. 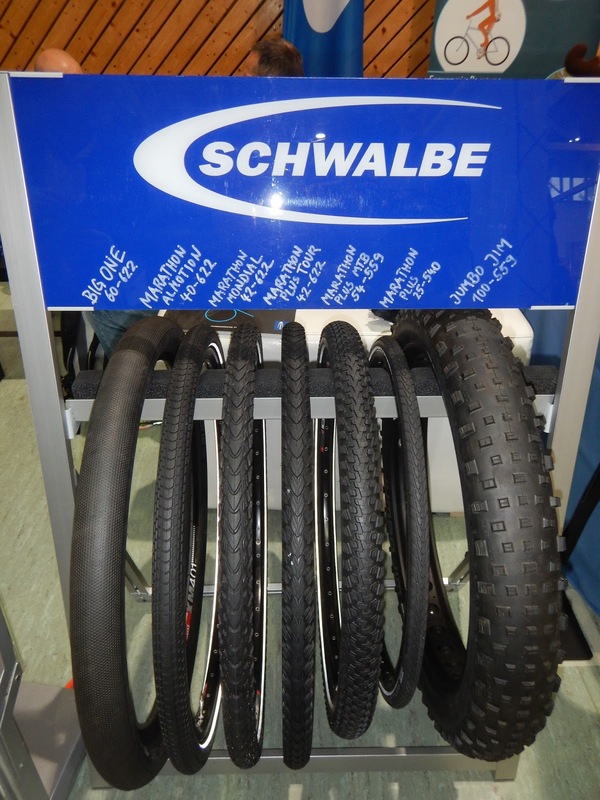 Over the next few days we will write about the exhibition, but here is a photograph of the Schwalbe stand. I wanted to ask whether one could buy a 16" JUMBO JIM tyre (on the right below) for a Brompton but my nerve failed me at the last minute.